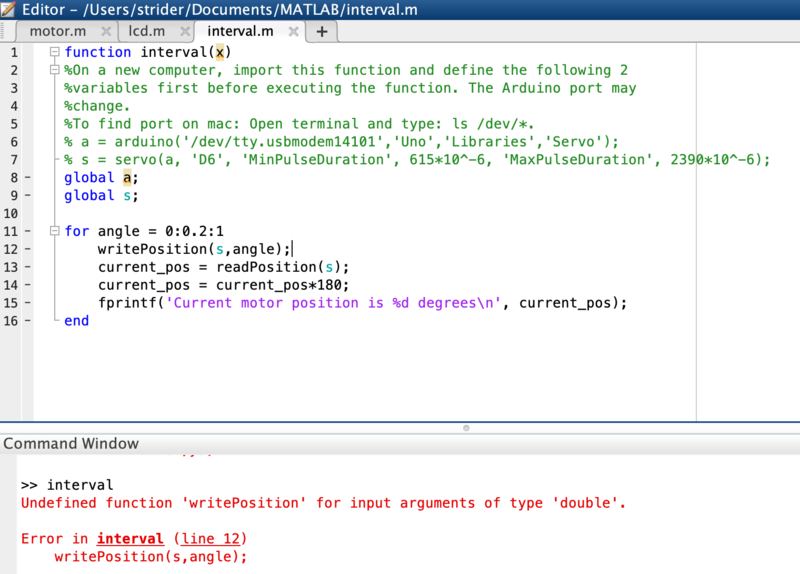 Hi, I have followed the guide from this page (https://www.mathworks.com/help/supportpkg/arduinoio/ug/control-servo-motors.html) on how to set up the servo motor via Arduino on Matlab. 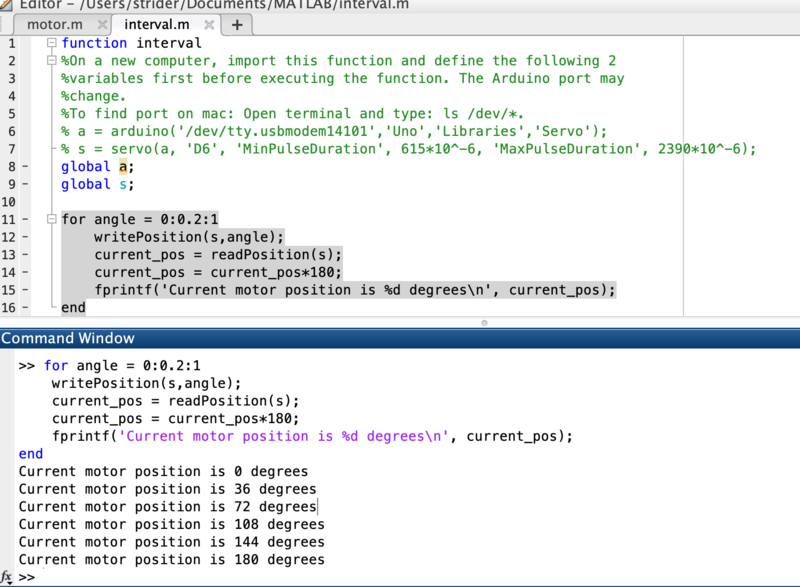 This page (https://www.mathworks.com/help//supportpkg/arduinoio/ref/writeposition.html) states that the writePosition function can take in any numeric value from 0 to 1, but yet the error shows up. Do you have arduino hardware support package installed? Yes, I have the package installed and set up. which version are you using 2018a? I mean which release are you using 2018 a ? Oh yes, I am using the R2018a. I have done so, but the error still persists. which writePosition -all % what shows up? Sorry, but i could not understand that. what's the value of s? However, if I were to run this code directly in the command window, it works. But it does not run properly as a function. uncomment the two lines before global a , see that's why global is not recommended making it harder to debug!!! But doing so will give me the following issues, while the writePosition issue still remains. 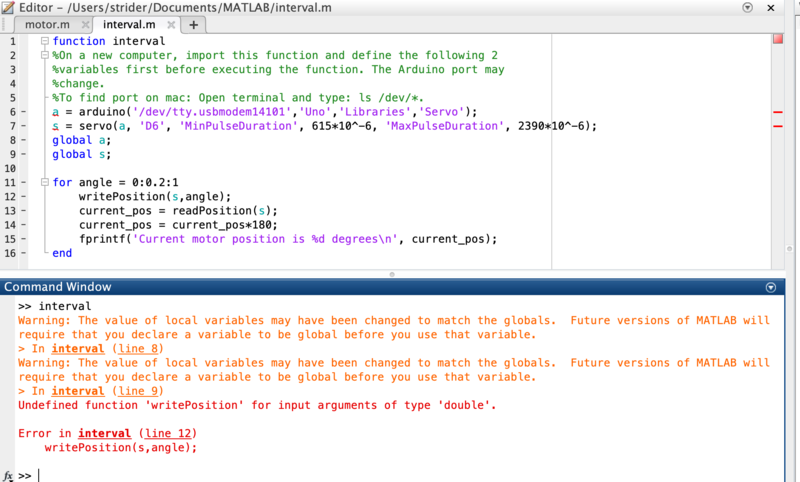 The error "Undefined function or variable 's'." will occur. how are you calling it ? by pressing the green triangle button ?can you upload the code? Hi, thanks for the help so far. I have reinstalled the package and the code is working again. Seems like some of the files got corrupted.